The world’s smallest bears can copy one another’s facial expressions with precision as a means of communication, researchers suggest. 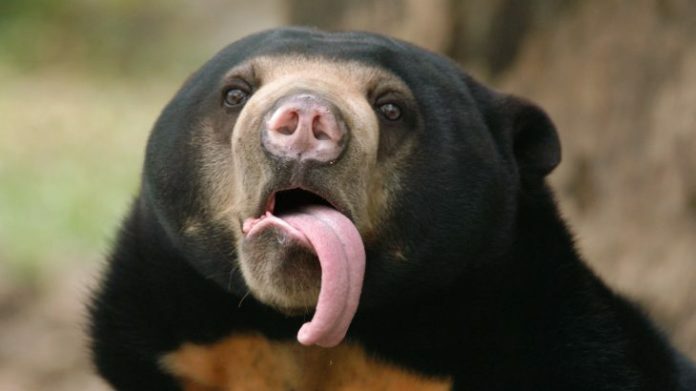 Sun bears have been observed opening their mouths to match their playmates when they are interacting face-to-face, according to a study in the journal Scientific Reports. It is the first time the behaviour has been seen outside of humans and gorillas, in non-domesticated animals, the authors said. The researchers, from the University of Portsmouth, studied 22 sun bears at the Bornean Sun Bear Conservation Centre in Malaysia. In total, 21 matched the open-mouthed expressions of their playmates during face-to-face interactions. When they were facing each other, 13 bears made expressions within one second of observing a similar expression from their playmate. Dr Marina Davila-Ross, from the University of Portsmouth, said the findings suggest the behaviour is exhibited outside humans and apes and could be more widespread in mammals. “Mimicking the facial expressions of others in exact ways is one of the pillars of human communication,” she said. “Other primates and dogs are known to mimic each other, but only great apes and humans were previously known to show such complexity in their facial mimicry. Sun bears, the smallest in the bear family, grow to between 120cm and 150cm tall and weigh up to 80kg. The species, also known as honey bears, are endangered and live in the tropical forests of south east Asia. While they prefer a solitary life, the researchers said the bears engaged in gentle and rough play. They suggest that the bears may use facial mimicry to indicate they are ready to play more roughly or strengthen social bonds. Co-author Derry Taylor, from the University of Portsmouth, said: “It is widely believed that we only find complex forms of communication in species with complex social systems.